After the highest-scoring Monday Night Football game in history, the Rams 54-51 win over the Chiefs, anything else from Thanksgiving Thursday was going to be a let-down, even though the Bears showed grit, won in Detroit despite having played the late game Sunday night using Chase Daniels as a backup QB. Hopes for those who bet the overs on the Thanksgiving night game between New Orleans and Atlanta were disappointed, but mostly because the Falcons had three costly fumbles. Which along with their usual red zone behaviour, as if it were Halloween and not Thanksgiving, resulted in a 'mere' 48 points. But the big takeaway from Week 11 was how close most of the games were, including the Shootout moved from Mexico City back to LA. Of the 13 games played, nine were decided by three points or less, another by four, and the Bears beat the Vikes by five. Only the Colts, surprisingly crushing Tennessee by 28 (38-10) and the Saints blowing out the Eagles 48-7, bucked that trend. While we all have visions of overs dancing in our heads, especially when my best bet last week was to go over on the Rams/Chiefs, even though 63.5 was the highest total ever. I was wrong on the Falcons being value at home last week, though in all honesty I watched that game again and they should have covered. My outside bets were better: the Bears did go over a modest 10.5 in the first half (with 14) and with the Vikings' help they just managed to clear the 44.5 Total Points line with 45. But I went guts or glory on the Chiefs on the Moneyline; sure, if they'd held a couple of interceptions they would have won, but remember they were getting 3.5, reminding me to pay closer attention to the spreads given the closeness of games, and to remember, in the face of scores like last week's 20-19, 23-21,20-16, 22-19 etc, that not every team has a Drew Brees or Pat Mahomes throwing, or Sean McVay or Frank Reich coaching. Yes, I know the Bucs are awful, but they have the potential to put up tons of points, even against decent defences, and the Niners D, while promising, isn't yet good. Plus, they are a team with only two real weapons, tight end George Kittle and versatile running back Matt Breida. I have one doubt about this one: coach Kyle Shanahan has had the bye week to prepare for the Bucs, and can assume Jameis Winston will start. Whether it's Winston or Ryan Fitzatrick you can expect turnovers, but at home, in an early start, against a west coast team, Tampa ought to cover three. The over (53.5 at 9/10) is more of an outside bet, but I would give it serious thought. The Eagles look awful right now. They don't have any running backs, Golden Tate has not provided a deep threat receiver, their defence is completely beaten up both in the line and the secondary. Their playmakers on the D line need more rest than they're getting and they might as well hold open tryouts to find new starters in the defensive backfield. The Giants' O line has started to look good in recent weeks, admittedly against teams who aren't great up front, but that formula applies this week too. With Saquan Barkley running and catching, a few big plays are always in the mix, and Odell Beckham Jr is likely to make one or two as well. 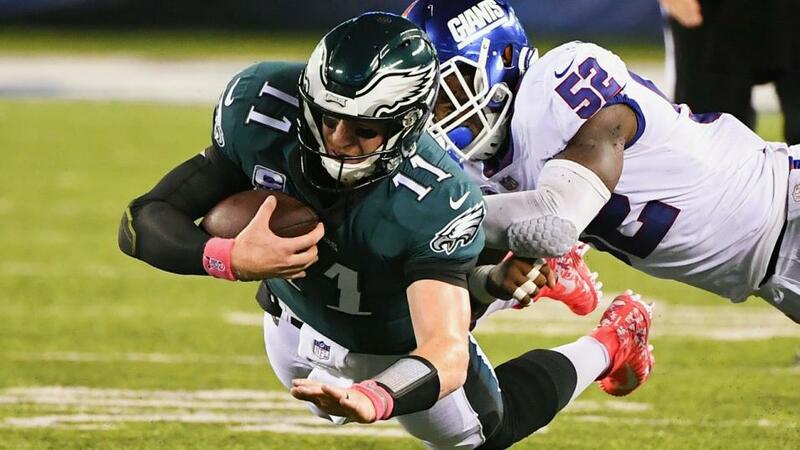 The Giants scored 38 against Tampa, 28 against the Eagles is not out of the question. The Eagles could manage only seven in New Orleans, 21 is not impossible here. Even if you switch the teams, you've got 49. It's asking a lot to win on the road in this division, but Cleveland has been a better team since Hue Jackson left, and I don't know as Hue's expertise about Baker Mayfield translates into benefit for his new team against his old. The Browns had the bye week to prepare, while the Bengals were getting dominated by the Ravens in a game. Admittedly, they still kept it close. If that worries you, consider Cleveland (+3 at 4/5). I won't call you a coward, because another close game could be in the cards, and while 3.5 might make me abandon the outright, better safe than sorry. The Unders (46.5 at 9/10) is another consideration, but I worry about defensive TDs from the Browns.